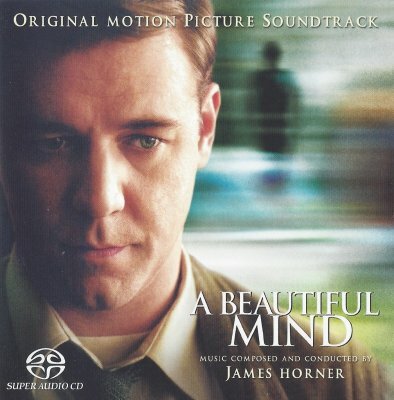 James Horner’s score for “A Beautiful Mind” is presented on this SACD release with both DSD 5.1 and 2.0 tracks. The 5.1 presentation was mixed by Simon Rhodes, who I believe was the score mixer on the movie, as well (so I’m guessing the 5.1 presentation of the score here is presented in the same fashion as when heard within the movie’s 5.1 mix.) Although some of the composer’s scores have sounded similar to his other works, this effort is a successful and highly memorable departure. Most of the score offers quiet, beautiful melodies that shift between uplifting and dark/melancholy, although, like the movie, even the more moody tracks of Horner’s score still offer a sense of hope. The lush, beautiful theme that can be found woven into several of the score’s tracks is a welcome presence whenever it is heard, never becoming tiring. The 5.1 presentation is a very enjoyable one, if as subtle as several of the tracks within the album. The surrounds are involved throughout the presentation, but in a light, gentle way that appropriately enhances the experience and opens the music into the listening space. There is nothing remarkable about the surround mix, but its simplicity certainly works to its advantage, never directing the listener’s attention one way or another. The 2.0 presentation is also quite nice for those listening on two-channel systems, offering very pleasing clarity. Personally, I preferred the 5.1 presentation, because it provided a more immersive experience, and did so subtly and without negatively affecting the listening experience. While the 5.1 presentation is very enjoyable if not attention-grabbing, I certainly took notice of the SACD’s sound quality from the opening moments to the very end. The sonics of this particular title were nothing less than tremendous. Every delicate nuance of Horner’s work was brought to the experience with pin-drop clarity and stunning definition. Orchestral elements seemed to almost float outward from the speakers, presenting themselves with a lush, full quality that was thrilling. The presentation hit both ends marvelously – rich, luxurious bass and crystal-clear highs were both in evidence. Overall, I found the sound quality of the SACD to be simply breathtaking. Final Thoughts: “A Beautiful Mind” is one of the composer’s most haunting works, perfectly communicating the themes of the movie. The SACD is a marvelous experience, presenting Horner’s score with exquisite clarity and stunning detail. Highly recommended, especially at the price – the SACD can usually be found in the $15 range.